Celebrating South Korean president Moon Jae-in’s first hundred days in office, various events were held in the country on August 17. In the morning of the 17th, the national postal service of South Korea issued commemorative stamps to celebrate the inauguration of the 19th president of the nation. The printed five million stamps, five hundred thousand small-size stamp sheets, and twenty thousand stamp albums quickly went sold out, and some of the supporters even camped out to secure enough supplies. 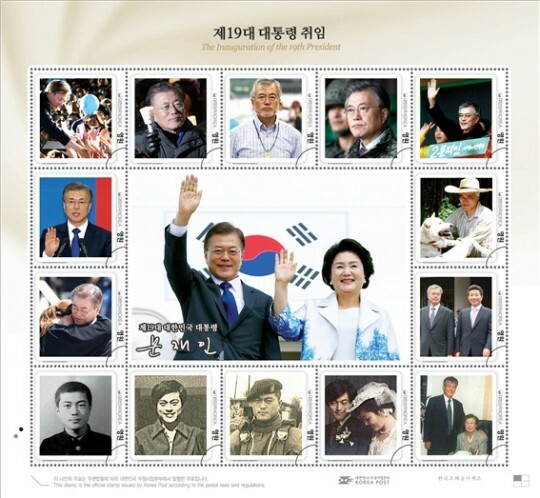 Commemorative stamps issued to celebrate the inauguration of the 19th President [Korea Post]. In the afternoon, the Blue House held an open house event. 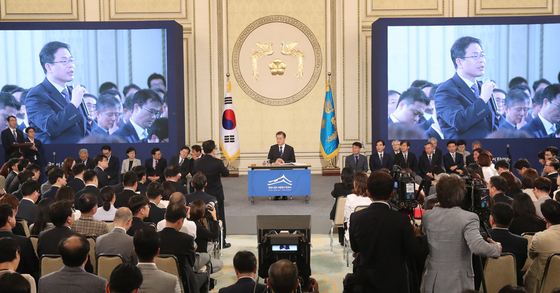 Moon hosted the tour himself, introducing the Main Office Hall and the Secretariat Buildings to about 300 members of the media who have access to the Blue House. People celebrated Moon’s 100th day of the presidency on social media as well. On Twitter and Instagram, people posted messages with a hashtag reading, #ThankYou_MoonJaeIn, expressing gratitude to the president. The hashtag was ranked as the most trending topic on Twitter Korea. The president replied to the supporters by sending a “selfie video message” through his social media account. The president also mentioned the political tension with North Korea at the news conference held at the Blue House presidential resident on August 17, as the country is facing a series of threats from the North. Moon Jae-in having a news conference at the Blue House presidential resident [Joins]. “There will be no war on the Korean Peninsula ever again,” Moon said with confidence. The 19th president of South Korea, Moon Jae-in impressed the nation with an 84 percent approval rating, the highest of any Korean president in his or her first month in office. On the 100th day of his presidency, Moon Jae-in is maintaining a high approval rating at 78 percent.